Seafood has a long history in Nova Scotia, and with 13,000 km of coastline, you’d be hard pressed not to find fresh fish, smoked salmon, scallops, and mussels on local menus. 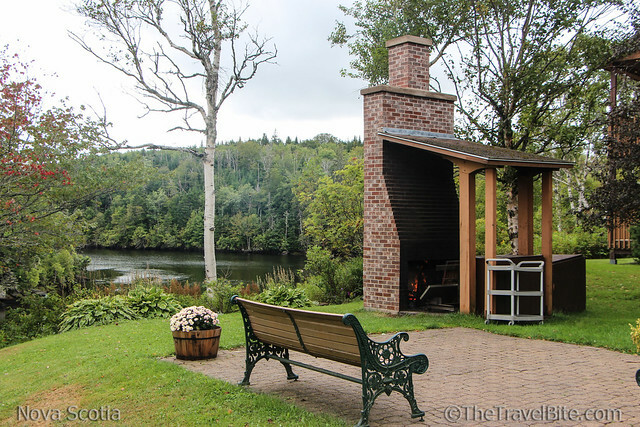 Close to Nova Scotia’s eastern shore and located right on the Liscomb river, Liscombe Lodge has a smoked salmon tradition that has been around for centuries, beginning with the salmon migration to the river and the Mi’kmaq Nation. 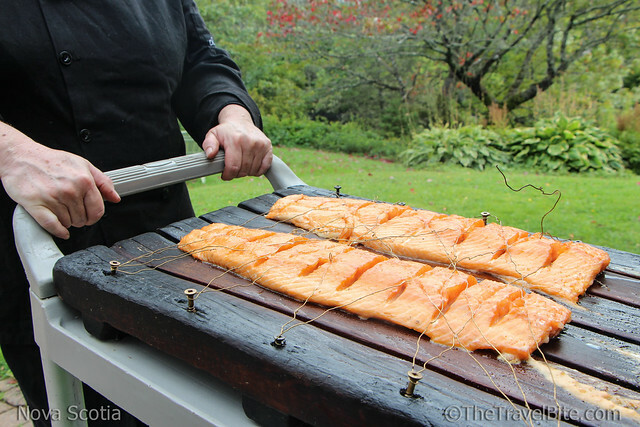 Pete and I had the opportunity to chat with Chef Anne McDougall about the history as she smoked salmon for the evening’s feast. We discovered the secret is in the sauce as it’s continually basted in a glaze made of butter and maple syrup. 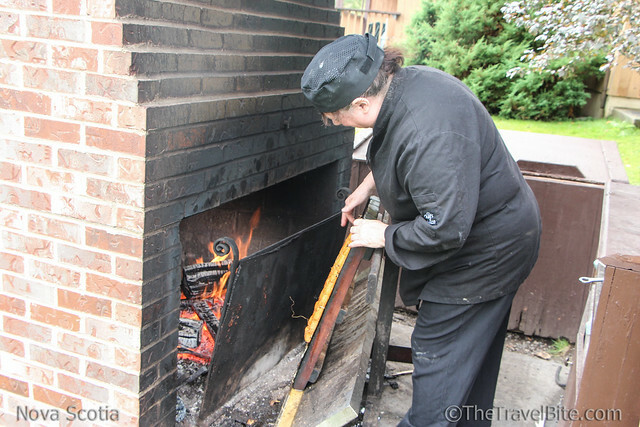 She wheels the plank right up to an outdoor fireplace and gingerly checks on it, continuing the basting as it smokes for up to an hour. When we finally had an opportunity to taste it that evening, let me tell ya, I could have eaten the whole fish. But, what’s not to love about butter and maple syrup? The recipe is quite simple, and Chef Anne generously shared it with us below so you can make it at home on your grill or oven. Melt butter and maple syrup together in sauce pan, stirring until smooth. Baste the salmon thoroughly with the glaze. 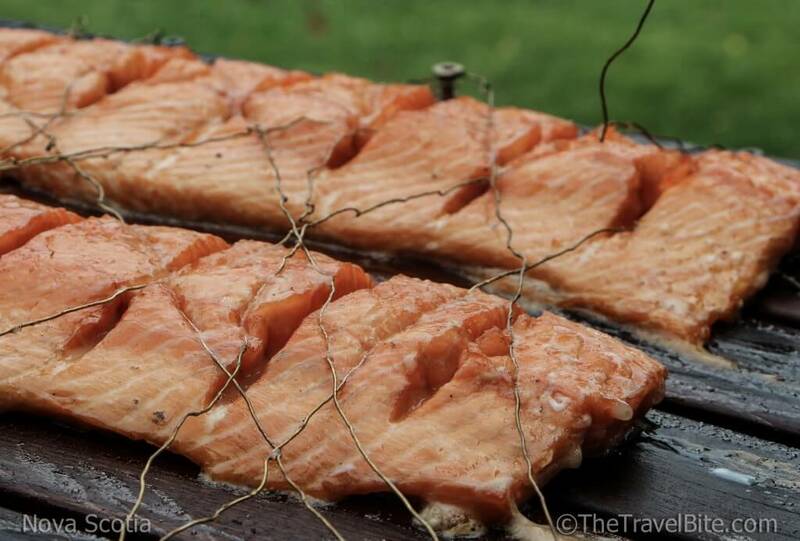 If barbecuing on Cedar Plank: Place salmon fillets on plank, skin side on the wood. 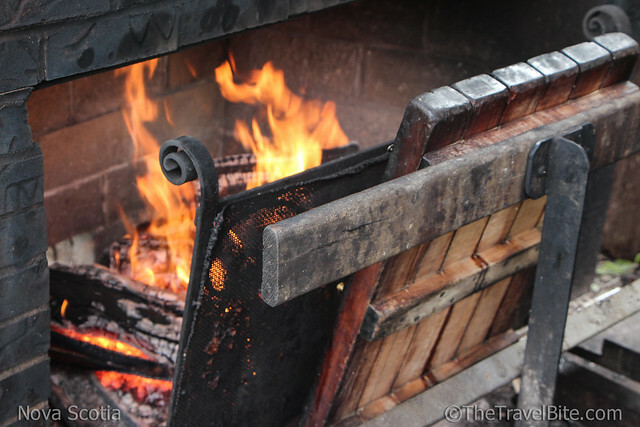 Place plank back on hot BBQ grill and close the lid. If baking in the oven: Lightly oil a shallow baking pan and place the salmon skin side down in the pan. Bake for 20-25 minutes at 350 degrees. Continue to baste the salmon with the maple glaze sauce every 5-7 minutes. Salmon is done when it is light pink in color and no longer looks translucent or jelly-like. Nova Scotia… that explains the missing cayenne spice we would add here in the South. I bet it still tastes awesome though!